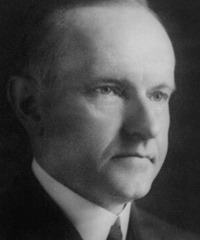 John Calvin Coolidge, Jr.served as the 30th President of the United States. Boston Police Strike, 1919: MS state national guard cavalry passing cam on horseback. GV national guardsmen wearing campaign hats maintaining peace on street, rifles over shoulders, Whiskey delivery truck seen in BG. MSs storefront with signs maintaining that they're open for business, pedestrians walk past. MS newly recruited police officers filing from building, some in uniform. MSs Massachusetts Governor CALVIN COOLIDGE inspecting police recruits. MS Govenor Coolidge shaking hands with Boston police chief. Nice iris MS Calvin Coolidge leaning against marble balcony railing. Kellogg-Briand Peace Pact of 1928, United States: Panning MS President Calvin Coolidge, Sec. Kellogg & Presidential cabinet at signing. MSs President Coolidge signing the Kellogg-Brian Peace Pact. CU antiwar treaty with Coolidge's signature. Charles Lindbergh Hero's Welcome in Washington DC: GV Charles Lindbergh alighting U.S. naval vessel w/ his mother Evangeline Lindbergh (VO also mentions Navy Sec. Charles Adams, though he did not hold the post until 1929; Curtis Wilbur was Sec. in 1927). MS Lindy shaking hands w/ crowd on dock. GV Lindbergh entourage leaving docks via open-air car. LSs Lindy arriving at ceremony in DC. MS President Calvin Coolidge greeting Lindbergh at podium. High angle LS massive crowd gathered. MS President Calvin Coolidge awarding Charles Lindbergh w/ the Distinguished Flying Cross. EST MLS of the Capitol Building. MS profile of CALVIN COOLIDGE. Montage of 1920's economic boom: reverse motion of coin money stacking itself high; reverse motion of paper money in pile; high-speed subjective shot along El tracks; high angle ECU's of drums, cymbals, trumpets, pianos & violins being played; reverse motion of coin money stacking itself high; reverse motion of paper money in pile; CU/MSs stock traders yelling orders; reverse motion of coin money stacking itself high; reverse motion of paper money in pile; CUs legs & faces of dancing girls; CU man playing trumpet; time lapse of clouds moving over moon; CU paper money blowing; CUs coins stacks falling. Still Photos are not available for licensing. 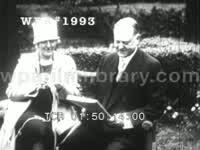 MSs President CALVIN COOLIDGE with politician, then writing in office. TLS Coolidge farm in Vermont; MSs Calvin Coolidge sharpening scythe, threshing wheat. Voiceover is not available for licensing. GV Harding Memorial in Marion, Ohio. MS graves of Mr. & Mrs. Warren G. Harding. GV Calvin Coolidge boyhood home in Plymouth Notch, Vermont, two horses pulling man on sled through the snow seen in FG. Panning MS dim room in Coolidge homestead where Cal's father administered Oath of Office upon Harding's death. Establishing elevated GV Massachusetts State House. MSs President Coolidge, wife Grace Coolidge and Senator Charles Curtis (R-KS) getting into carriage at White House, posing for cam on Inauguration Day, March 4, 1925. Cut to MSs Calvin Coolidge working on his Vermont farm: chopping wood, spraying crops, digging ditches. MSs Calvin Coolidge meeting with American Indians (Native Americans) dressed in full regalia; they award him a war bonnet (feather headress). MS stoic Calvin Coolidge sitting in bleachers of baseball stadium, wearing the war bonnet, looking rather silly. Footage is damaged. Calvin Coolidge: Vacation days at the old home in Yankeeland. Calvin Coolidge moving hay with a pitchfork. Far, far from the Capitol s hectic concerns. Coolidge sitting on a truck with hay. Coolidge on campaign trail, 1924: MSs President CALVIN COOLIDGE and wife Grace Coolidge shaking hands, watching parade of supporters, pinching cheek of big fat baby; sideview MS President Coolidge speaking to outdoor crowd; TLS crowd, people in FG waving small American flags; MS Calvin Coolidge speaking to camera-- "These are some of the reasons that I want to cut down on public expense. I want the people of America to be able to work less for the government & more for themselves. I want them to have the rewards of their own industry. This is the chief meaning of freedom." Keeping Cool With Coolidge. MS President CALVIN COOLIDGE speaking about the revolutionary marriage of sound & motion pictures: "This invention is faster nowadays than ever before. He who keep abreast of it would have no time to do more than note its accomplishments & marvel at them. So let me admit that in helping to make the amazing record which is to be produced of this scene, I have only the most general idea of what it is mechanically & scientifically that is being done. 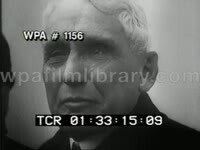 But I am sure that a photofilm of this scene is to be produced, combining a record for both the eye & the ear, a record that may be described as a speaking, moving picture." Great MS Governor of New York AL SMITH (Alfred Smith) singing the Gay 90s song "The Bowery" from "A Trip to Chinatown"; Governor Al Smith gets the crowd to join in, all singing amusedly (natural audio). MSs U.S. President CALVIN COOLIDGE in office. Montage of college-age Army volunteers camping and training in Plattsburg, NY: traveling shot tent camp; MS two soldiers with tent; MS soldiers peeling potatoes; MS soldiers standing in line, receiving grub; MS soldier sitting in grass, eating; good CU soldier munching on chicken breast; TLS train of immaculate Ford Model A cars arriving at camp; MS President CALVIN COOLIDGE walking with U.S. Army officers; panning MS young soldiers marching with shoulderbound rifles; CU Calvin Coolidge reviewing troops. Run for Presidency: CU/MCU Calvin Coolidge speaking at public event. MCUs Herbert Hoover surrounded by press. MS Hoover & wife Lou walking along porch of their Palo Alto home. MCU/CU Hoover seated in wicker chair. 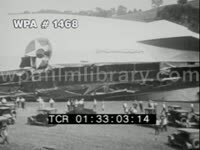 Charles boards the USS Memphis, returns home to America, dirigibles overhead. 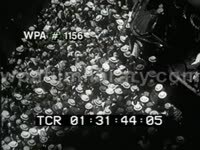 Parade through streets of Washington DC, press corps in full effect; nice shot military marching band with Capitol Dome in BG; Charles and mother in motorcade; President CALVIN COOLIDGE presents Charles with the Flying Cross.